Blazin' Sticks | Seize the knitting needles! When I was in high school, I created this blog as an outlet for talking about knitting. No one I knew who was my age was as obsessed/addicted to knitting like I was. Then I got to college, and knitting was cool, although I was still the only one I knew who was obsessed with it. I’ve been thinking about jumping back into blogging lately, even though I have a knitting community now. And apparently it’s been 8 years since I registered with WordPress. So. Here’s to more knit blogging! FYI, I’ll be blogging over with Marina at Clear As Glass from now on. Having a blog with Marina is something I’ve wanted to do for awhile now, and I’m excited it’s finally happening! Also, I will be continuing my 100 Great Movies over there too. I’ve enjoyed blogging under the title “Blazin Sticks”, and I’m leaving this blog up. At least for now. I don’t feel that I did this movie justice in my last post. So I’m going to talk about it some more. Wait! don’t leave! let me convince you! (Leonard Nimroy talks about the Vulcan Salute). So, when I saw the trailer…I was pretty excited. And then I saw the movie. It’s not just for Trekees. This movie has good action in it, good special effects (although it’s not that hard to be better than the ones in the original series). It stars Chris Pine as Captain James T. Kirk, and it tells the story of how he went from getting fights to Captain of the U. S. S. Enterprise. Zachary Quinto Stars as Spock, although Leonard Nimroy also makes an appearence. Seriously, it’s not just for geeks and people who watch the show as kids. So, I went on vacation last week…..finished a book, bought a magazine. The magazine I bought was the Spring/Summer 2009 Vogue Knitting. Now, I have kinda shyed away from VogueKnitting since Adina Klien left (and I would still like to know why she left, because I LOVED Vogue knitting when she ran it). Trisha Malcolm, I honestly don’t like the magazine as much under her. Too much trendy for a knitting magazine. Don’t get me wrong, I like to be trendy, but I don’t like it when the patterns are so trendy that by the time you’ve finished knitting them they’re no longer in style. However, I flipped through this issue some, and I bought it. LOVE IT. It has a bunch of things I want to knit (even though I probably won’t get to all of them, it’s nice to have the inspiration around). So, SO reccomend this issue. The other thing I’ve been reading lately is Pride and Prejudice and Zombies by Jane Austen and Seth Grahame-Smith. I love Pride and Prejudice. Pride and Prejudice and Zombies is even better! What would happen Elizabeth had to fight Zombies on her way to visit Jane at Netherfield Park? Although this book has many hilarious lines, my favorite is this one: “She remembered the lead ammunition in her pocket and offered it to him. ‘Your balls, Mr. Darcy?’ He reached out and closed her hand around them, and offered, ‘They belong to you, Miss Bennet.’ Upon this, their colour changed, and they were forced to look away from one another, lest they laugh.” So, SO good. I also finally saw the new Star Trek movie. It was AWESOME. I LOVED it and can’t wait to see it again (also now I’m going to watch, um, ALL of the original show). Anyways, I recommend any and all of the above. Although the summaries are written by me, these are my comments. Thank you, thank you, thank you for writing all the many wonderful books you do. As I reread through “The Princess Diaries” series – which I loved the ending to, by the way, I am struck by how AWESOME your books are, again. They are perfect escapist reading. In fact, your books have always been escapist reading for me. The first book I read was The Princess Diaries. The second week of sixth grade, my middle school had a book fair. I saw the book and, having seen the movie about a month before, HAD to have it. I remember that as soon as I saw it I stared thinking about how I was going to get the necessary $5.99. How I did, I have for gotten. But Tuesday of the second week of sixth grade happend to be 9/11/01. I bought it on 9/11 – which I only know because I remember reading it that night while the news was on. In my childhood, there are few times I can remember the news being on in the evening – they are: the 1996 Presidential Election, the 2000 Presidential election, and 9/11. I remember reading a little bit, watching a little bit. From then on, your books have always been escapist reading – especially through middle school (which was the worst three years of my life thus far and I would only do it again for a million dollars a year after taxes each year for the rest of my life).When I was in eighth grade, following the second biggest snow storm I have seen, you came to Portland, Oregon. To Portland’s awesome Powell’s Bookstore (on a side note, that particular branch moved, and they demolished the building it was in. So sad!). I got to hear you speak (a lot of it was about lyme disease, which you had recently been diagnosed with). And you autographed all six of your books that I owned at the time plus the book we bought then (Boy Meets Girl, which you were touring for). Several of The Princess Diaries books I have actually gone to the store the day they came out to buy – and Forever Princess was no exception. I bought it, started reading it on the bus on the way home, and finished it in a few hours. It ended exactly the way I wanted it to end, too! And having graduated from high school six months before, it really hit home with me. I was, admittedly, sad that it was the last of The Princess Diaries books. Please, please, please write more – about Mia in college!!! Being in college now myself, I would LOVE to read them!!!!! Do you think you will ever write and illustrate any children’s books? Because that would be awesome!!! Keep on writing awesome books! Kudos! I don’t really talk about sewing on this blog…in the “About Me” part, I list it as one of my hobbies, but I don’t really talk about it. This is because when I learned to knit, knitting blogs were becoming big on the net. But I’ve been sewing since I was a little kid, and didn’t really assciate it with the web until knitting blogs started talking about sewing too. The bottom two are box bags from this tutorial and the top one is a small cosmetsics bag derived from the box bag tutorial. All of the fabrics are from my stash…the ice cream cones and cats were fat quarters, as was the lining to the cats bag. I didn’t mean to disappear from the blogosphere for so long! I guess I kind of got distracted…finishing up my first year of college (I passed Calc!) and then moving home for the summer (I SWEAR I’m not taking that much stuff to school next year. Seriously, it was RIDICULOUS. In liau of picture of the knitting I’ve done/been doing, I present…. …a new feature, because I want to share, in no particular order, 100 movies I think are good. Some of them are better than others. They’re all rated out of five *****. But I like all of them. They’ll be here and there…whenever I think to post, basically. As of now, I haven’t got a full list of 100 movies…I’m at 95. So here we go. So I finished this sweater last week….the “Elizabeth Bennet Cabled Cardigan” from Stefanie Japel’s Fitted Knits. When I first saw this sweater, I KNEW I had to knit it….it is named after one of my favorite heroines of all time (although I think Persuausion may have surpassed Pride and Prejudice as my favorite Jane Austen novel). And it has many things I like, such as cables and seed stich and being constructed as a top-down raglan. I modified it for a different gauge and a different bust size (I’m kind of small…who am I kidding, more often than not I have to alter patterns so that they’re smaller than the smallest size…I’m TINY) and had problems with the sleeves. Last week, I finished it (and it was raining raining raining, obviously finishing the sweater cleared it up so I couldn’t wear said sweater right away). Details Raveled here. 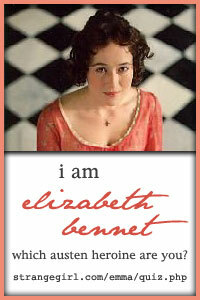 So I present to you…the Elizabeth Bennet Cabled Cardigan…. Love my new sweater, and also love the fact that this quiz confirmed what I already kind of knew: I am an Elizabeth Bennet! They say that necessity is the mother of invention. Well, I didn’t need this beret, but I wanted to make a slouchy, lacy, red beret from the yarn I had left over from my red cardigan….this is the result! Lace pattern based on “Little and Large Diamonds” from Lace & Eyelets: 250 Stitches to knit from the Harmony Guides. 180 yards Aran weight yarn – I used two skeins Debbie Bliss “Stella” (91 yards/83 meters per 50g skein, 60% silk, 20% cotton, 20% rayon), color 38009 (this yarn is discontinued). Gauge: 4sts/in in St st.
With smaller circular, CO 84 sts. Work in k1, p1 rib for 8 rnds. Switch to larger circular needle and work 2 repeats of lace chart. Break yearn w/ 6 inch tail and draw through sts. Weave in ends.